Telinta announced the addition of an In-Progress calls indicator to its call shop interface. The new feature will allow call shop operators to monitor the destinations and duration of in-progress calls in real time. Telinta’s fully brandable Call Shop solution has zero deployment time as it runs from within the web browser, and is very easy to operate. “Telinta’s Call Shop provides ease of use and effortless deployment for call shop resellers who are looking for a reliable solution,” said Alex Ferdman, CEO. 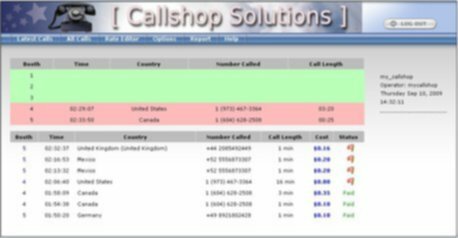 The ready-to-use AJAX web interface can be custom branded individually for each call shop reseller. Pre-paid and post-paid billing schemes, per-cashier collection reports, rounding of charged amounts to the needed denomination, flexible call rating, as well as printable receipts make Telinta’s hosted Call Shop an ideal application for call shop operators around the globe. For more information about the Telinta Call Shop solution, contact info@telinta.com.